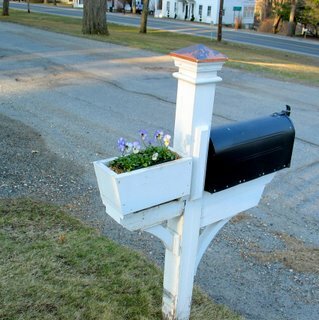 Welcome to Sharon, CT, Daily Photo! Inspired by ParisDailyPhoto.com, and the many other hometown blogs that have sprung up, I thought I'd share photos of my hometown, Sharon, CT. It's in the far northwest corner of the state, and has a population of about 2,000. I will probably include photos of other towns in our little area, including Lakeville, Salisbury and Millerton, NY. It's hard to pick the very first picture, but I chose this one because it gives the feeling of a small New England town, where details count and people take so much care over the little things. Spring is here, and on the town green, where this photo of delicate violas adorning a mailbox, was taken, the daffodils are coming up and the trees are starting to get a slight blush to them, though they won't leaf out for another six weeks. Welcome to the family, Jenny! It's always nice to see another "small town" (as opposed to metropoles like New York, Paris or Berlin, who are of course also great...) in the mix! Hello Jenny I am happy to share my city with yours in the dailyphoto family. Thanks for link, keep up the good work.